Cosatto Supa Go. The Slimline Streamlined Pushchair. The essential stroller. More than a regular stroller:  From-birth lightweight stroller with: – One-handed recline – Adjustable leg rest – Adjustable handle height – Extendable hood  Public transport friendly. – Umbrella Fold. – Auto Lock. – Carry Handle.  It features: – Easy-clean pop-off seat covers -Spacious storage basket – Raincover – Viewing window  Industry leading 4 Year Guarantee.  Stand out from the crowd with Great British Design. Inspire them with pattern like no other. This is storytelling for your baby. Get straight to the chase in Supa Go. 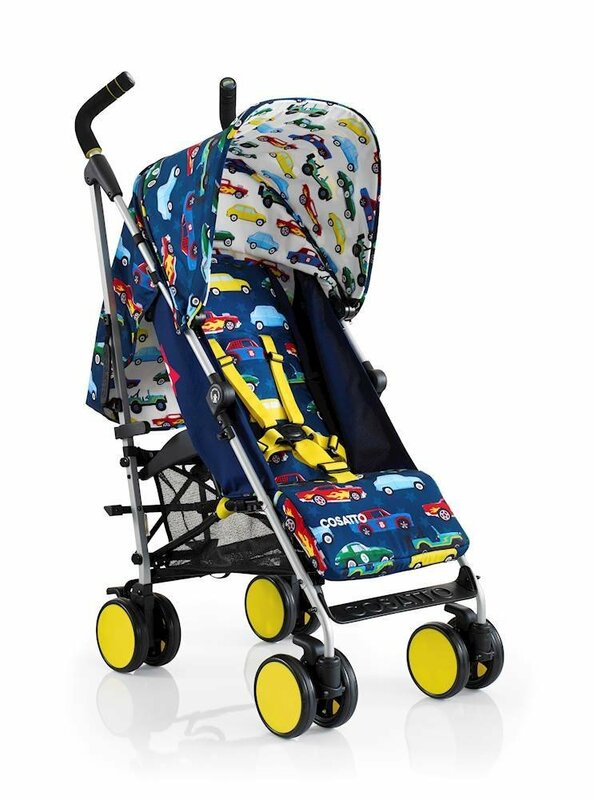 When youve got places to go, fast  Supa Go pushchair puts the fun in fundamentals. Enjoy smooth, streamlined simplicity with this A to B awesome set of wheels. This lightweight gad-about is a comfortable stroll. Its a walk in the park. Supa Go is your adjustable champ. From one-handed recline to adjustable handle height and transport-friendly umbrella fold, Supa Go does it. Live life on the go.  Suitable from birth.  Lightweight aluminium chassis with carry handle. Supa Go is transport friendly.  Compact umbrella fold with auto lock. Click it shut. Stash it. Get on with life.  One hand recline with 4 recline positions. Less of a handful.  Adjustable leg rest. For little laid back loungers.  Spacious storage basket for all your bits, bobs and big stuff. Thank us later.  Extendable hood sunshade protection. Supa Gos in charge.  Viewing window in hood. Peek at your passenger.  The original Cosatto raincover.  Adjustable handle height for your comfort. Supa Go is so considerate.  Pop-off seat covers for easy cleaning. Keep Supa Go sparkling.  Lockable front swivel wheels for tight spots.